Nothing is abandoned in the pictures. Or, in fact, it is a recovery and, or, salvation. 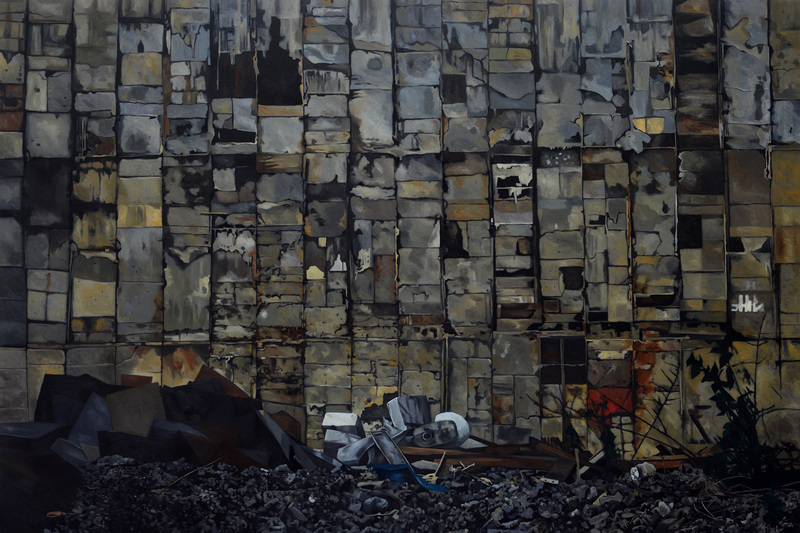 “Abandoned” is Soler Santos’ double take on scenes of encountered derelict sites in the rising, iron metropolis commonly known as Manila. A continuity on a set of premises and, or, (once again), an entirely separate idea altogether, it adds to the ongoing ruminations on ghost tableaus where things are forsaken and linger. 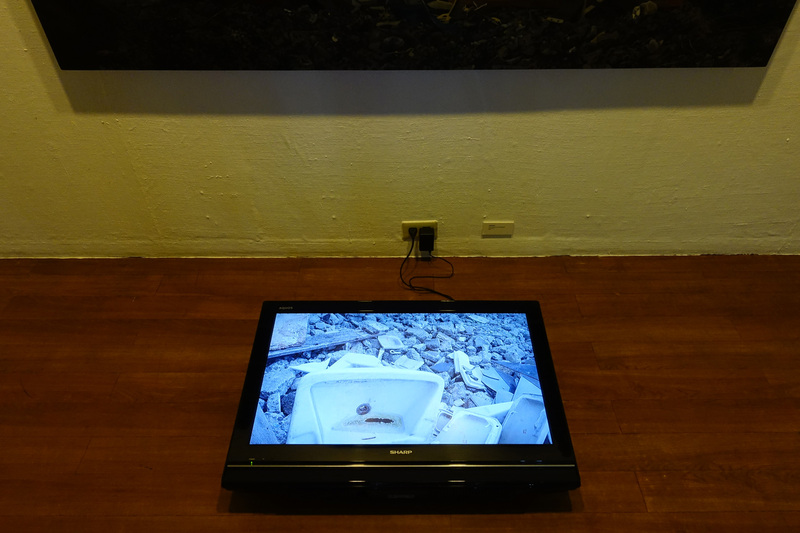 Two works comprise the redux: a looped video about stills of bathroom installments, crushed ceramic sinks, toilets, and other paraphernalia; and a big painting that depicts a paved, and, rhetorically speaking, wailing wall, stripped of its former glory, its industrial tile finishes taken down and leaving behind jutted traces of linear and modular divisions of cement, grout and would-be material excretions. 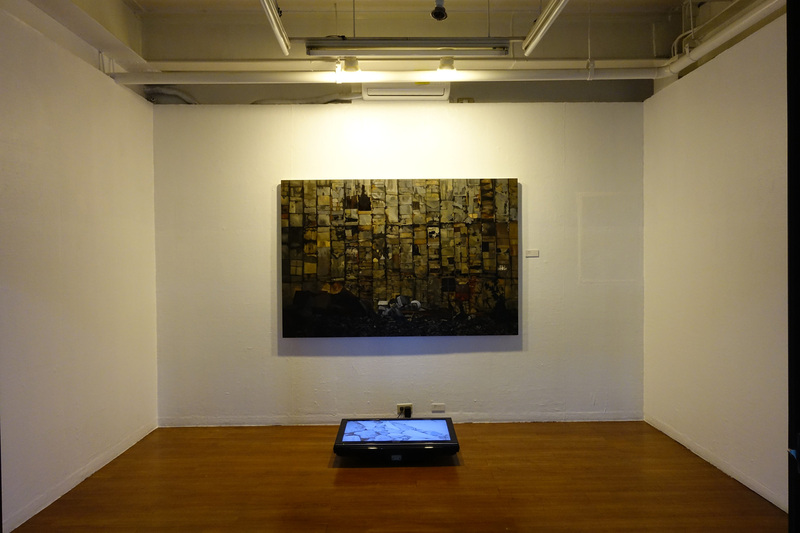 Both works—the video and the painting, allow the idea of being a whole entity. Oddly, it may be a dysfunctional narrative conspiring in its persistent repetition and breakdown of fractions and segments. A spoken word, spoken twice, spoken thrice, either piques our eardrums and gets us out of the doldrums, but, more importantly, its tone embodies another meaning (aba aba abba abba da da DADA). The emphasis resulting in the repeating of images is bull-headed, narrow-minded, and obsessive, and suggestive of a conceptual and minimalist stance, thus responsibly burdening our senses. It looks to negate a narrative, but does it? Out of the sequential prodding is an allegory in its constant reiteration. In its highest state, it is a visual haiku, as many things are said in its singular and undecorated symmetry. In its accessible mode, it poses again the reflection of stories and narratives. In the scenes of rubble, we are led to ponder- what has happened here, where are we going, and, what now? And for the bigger-picture inquiry: is this all there is? For all intentions and purposes, the artist’s particular view of painting moves back and fro. And this negotiation allows for the idea of a painting “becoming” based on a qualified proficiency. Then the practice covers more ground, and ultimately extending to the ideal field of art that raises the pertinent questions—which leads us once again to renew belief.